Description - The Turkey Vulture is an eagle-sized bird that is usually seen soaring over the countryside, its wings held upward in a wide, shallow V; the flight feathers are a silver grey with a black lining. This brownish-black bird has a long tail and its head is small, bare and red. It hisses or grunts when feeding or at it's nest but is usually silent. Distribution - The Turkey Vulture breeds from southern British Columbia, central Saskatchewan and the Great Lakes southward, wintering in southeast to southwestern America. They prefer mainly deciduous forests and woodlands and are often seen in nearby farmlands. Biology - Two white eggs with dark brown markings are placed in a rock crevice, a hollow tree or in a hollow fallen log without a nest or lining. The Turkey Vulture can coast for hours, swaying from side to side and riding on rising columns of warm air called thermals, while searching for a carcass. 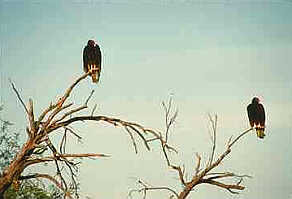 Turkey Vultures feed chiefly on carrion and refuse.